I have a brand new shop on ModifyWatches.com. Click here to see what I've included in my shop. I'm Brooklyne on Creative Market where I sell my simple graphics that can be used in digital scrapbooking and web applications. Click here to see what I offer. I'm also Brooklyne on Zazzle. You can find a lot of school supplies and matching dorm decor there. Click here to see what I have to offer. I'm Hedgehog & Rabbit on Craftsy. You'll find lovely embroidery designs including a dragonfly and a Halloween trick or treat bag design. Click here to see what I have to offer. I'm Brooklyne on Spoonflower where you can get my whimsical and graphical designs on fabric. Still working on getting prints available for sale, but if you have a request, leave a comment on the fabric you want and I'll make sure to do what needs to be done to get it purchasable. Click here to see what I have to offer. Click here to see what else I have to offer that's not yet for sale. 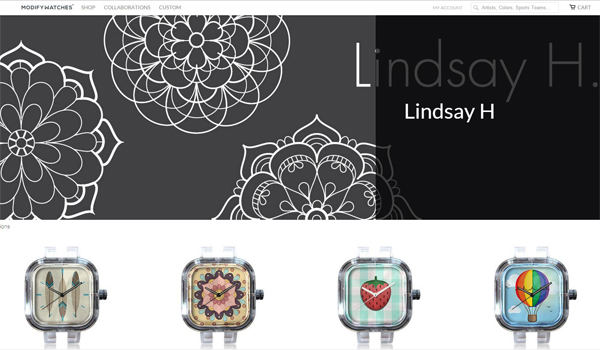 I'm LindsayH on Society6. You will see my whimsical designs on housewares for your home and office. Click here to see what I have to offer.